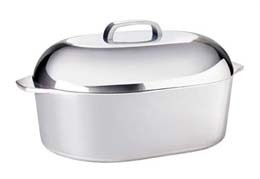 Heavy Cast Aluminum Covered Oval Roaster with choice of Non-stick interior or uncoated interior. 18"X 12 1/2"X 6 1/2" Oval Roaster with a high dome self-basting cover. Premium non-stick interior in roaster and cover, Attractive polished exterior, Polished stainless steel handle riveted for security, Anodized aluminum meat rack with 18 qt. / 17 liters capacity. Holds a 25 lb. turkey. Care & use instructions included. Notify me of updates to HEAVY CAST ALUMINUM COVERED OVAL ROASTER 18 QT.